Happy Tuesday, everyone! Here’s a list of patch notes for the latest Pre-Release update. Bugs are always expected in these work-in-progress builds so we could really use your help testing! We appreciate any bug reports and feedback you send our way on the Pre-Release forum. Now there are two ways to play the Arena. In Exhibition Mode, battle creatures in 1 vs 1 matches. First to score 3 points wins! Play in spectator mode (CPU vs CPU) if you want to watch the action, or Player vs CPU if you want to control a creature directly in battle. Points are awarded by scoring a knockdown or by how well a creature did offensively before the round time ends. Knockdowns trigger a snazzy slow down moment. In the “corners” between rounds, apply bandages and feed to prepare for the next round. 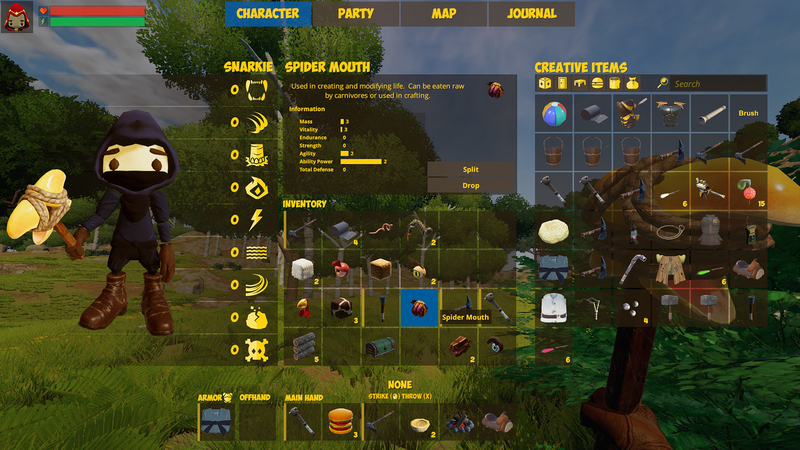 Cameras will now automatically follow the creatures and capture all the action (when you’re not directly controlling a creature). If you want to control the camera yourself, launch a game in Elimination Mode. This new console replaces the / (slash) commands previously used in the chat window. Press ` (accent) to access the dev console. Use /help to view all available commands. Click to select block/place is back, in addition to the existing drag & drop mode. Lock mode added that lets you repeatedly reuse a selected block. When toggled on, whatever block you currently have selected in the Life Block tray can be used repeatedly, without re-selecting it each time. 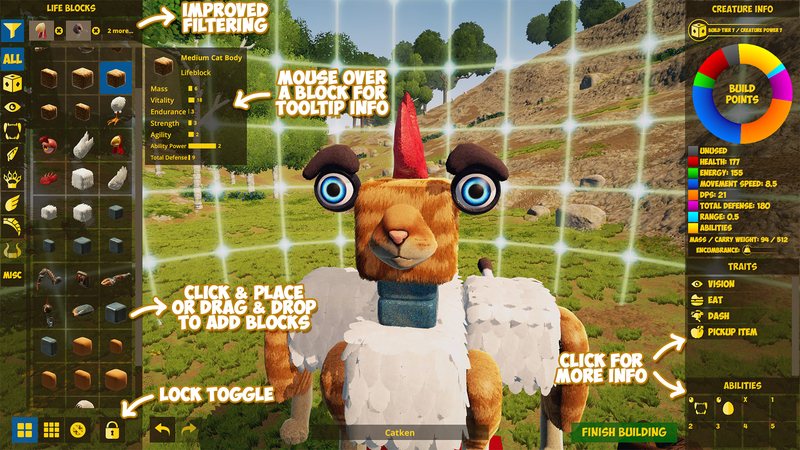 Toggle it off to clear the selection and allow for manipulating blocks already placed on the creature. Traits added. Traits are automatically granted based off how a creature is built. Changing all screens to work in fullscreen for all aspect ratios. Compare creature power with a new stats radar graphic. Stats themselves are still being adjusted. Once we’ve standardized this, the radar will become more clear. New fullscreen, animated Arena creature selection! Some creatures are angrier than others. Pathfinding fixes. Creatures should no longer walk through walls. Dog buffs now properly increase stats. Electric shock ability now uses energy. Multiplayer world syncing improved (trees/bushes) in Creative Mode. NOTE: Initial connect is still buggy. You may have to try multiple times. Thank you for helping us test these updates! We hope you like them.